Russian verbs of motion belong to a special category of verbs used to describe the means of transportation or ways of movement. They are handy to describe a variety of situations – when you walk to a nearby store, take a bus to the market, or go across the city by subway. Russian verbs of motion are complicated and often confusing to students learning Russian. Here you'll find all information about each verb from this category. Learning about the verbs of motion can be one of the hardest concepts in Russian language. It is not so difficult if you take them one step at a time. However complex an idea it may seem, it is an important concept, since motion verbs are among the most used in any language. A verb of motion is simply a verb that moves you or someone or something else from one place to another. But not all verbs expressing motion in Russian fall into the small group of verbs which is referred to as the Verbs of Motion. The most frequently used verbs of motion (14 pairs) are shown in the table above. 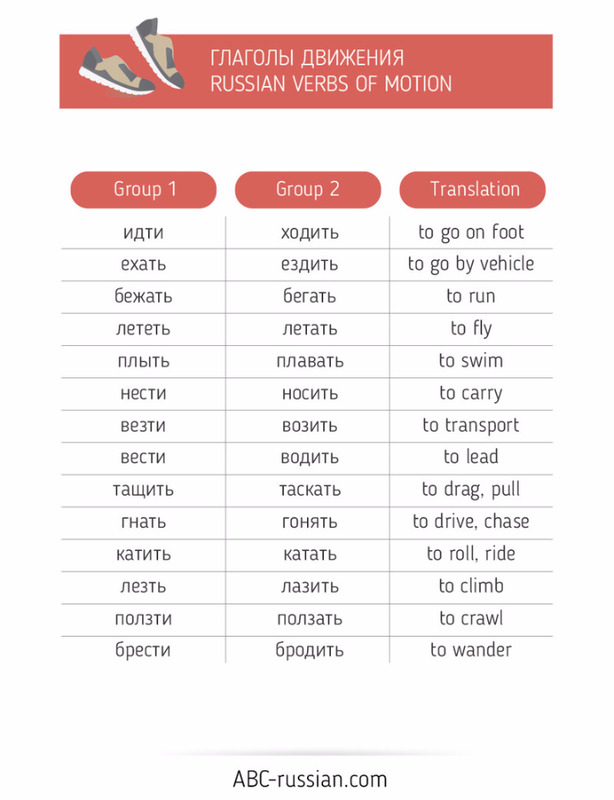 Russian verbs of motion are unusual, since they come in pairs: there are two verbs for each type of motion, a unidirectional (Group 1) multidirectional ( Group 2) form. In this table you see unprefixed verb of motion. All unprefixed verbs of motion are imperfective. Russian verbs of motion can combine with up to sixteen prefixes. When prefixes are added, however, the result is a new verb with the new meaning. The multidirectional form becomes the imperfective form, while the unidirectional form becomes the perfective form.